An eagle in Alaska tore a Coast Guard officer's hoodie and chased him down a mountain with multiple aerial attacks as he ran, causing him to stumble and lose his cellphone. The big bird pecked at the phone a few times, then flew off with the device, which hasn't been seen since and was probably dumped in the ocean, according to the victim, Lt. Andres Ayure. "That was my 'welcome to Dutch Harbor' story," said Ayure, supervisor of the Marine Safety Detachment in Unalaska. On a Saturday, three days after arriving in Unalaska, he decided to enjoy his day off by hiking up Ballyhoo Mountain and climbed to the top of the 1,634-foot peak, which overlooks the airport. The hike was pleasant enough, and Ayure saw other people as he climbed. He was wearing shorts and an American Eagle-brand hooded sweatshirt. When he was about a quarter of the way down, an eagle swooped him three times, only missing him because he managed to duck, but made contact on the fourth attack. "It got close enough to hook me on my hoodie," said Ayure, displaying the sweatshirt with a hole in the hood. The eagle made about another six attempted attacks as Ayure fled down the mountain. About halfway down, the attacks stopped when the bird grabbed the cellphone, which had fallen from his pocket. Ayure, though, didn't stop running until he reached the bottom. "It was crazy," said Ayure, who arrived in Alaska from the San Francisco area. The next day, Ayure and two other Coast Guardsmen returned to search unsuccessfully for the cellphone, holding up hiking poles to appear larger and discourage aggressive eagles. Fortunately, no further attacks occurred. "I'm definitely keeping an eye on them when I go out now," Ayure said. 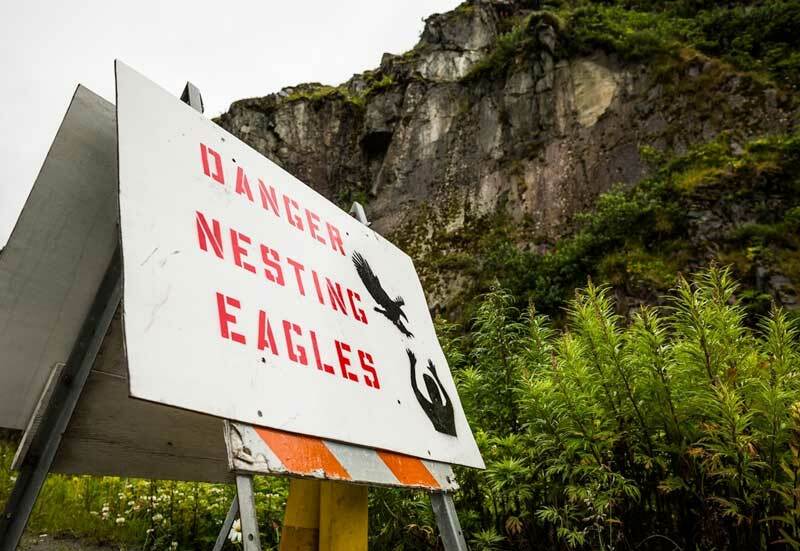 Hundreds of eagles live in Unalaska/Dutch Harbor, the nation's busiest fishing port. The population is artificially high. Hundreds gather around trash bins, perch on streetlights and crab pots, fly dangerously close to oncoming vehicles and, every year around this time, claw people's heads. Warning signs are posted annually near known attack sites.